There are several storage compartments at various points in the vehicle. 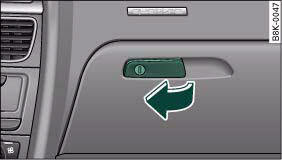 The glove box is equipped with a lock* and a light. 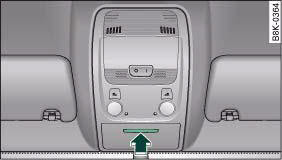 – Pull the catch on the lid in the direction indicated (arrow), fig. 101 and open the lid. – Close the lid and push it in until it engages. The glove box lid has separate holders for a pen and a note pad. On the right-hand side of the glove box there is a holder with a key shell. In order to start the engine with the spare key, it has to be clipped into this shell. To avoid the risk of injuries, always keep the glove box lid closed when driving. – To open the cover, lightly press the panel ⇒ fig. 102 (arrow). The cover will then open by itself. The coat hooks are located on the rear side of the B-pillars (in the rear passenger compartment). • Please make sure that any items of clothing hanging from the coat hooks do not obstruct your view to the rear. • Only use the coat hooks for light items of clothing and make sure that there are no heavy or sharp objects in the pockets. • Do not use clothes hangers to hang up the clothing, as this could interfere with the function of the head-protection airbags*. There is a fold-out drawer in the front part of each front seat. – Pull the handle to open the compartment. The storage compartment will hold a maximum weight of 1 kg.